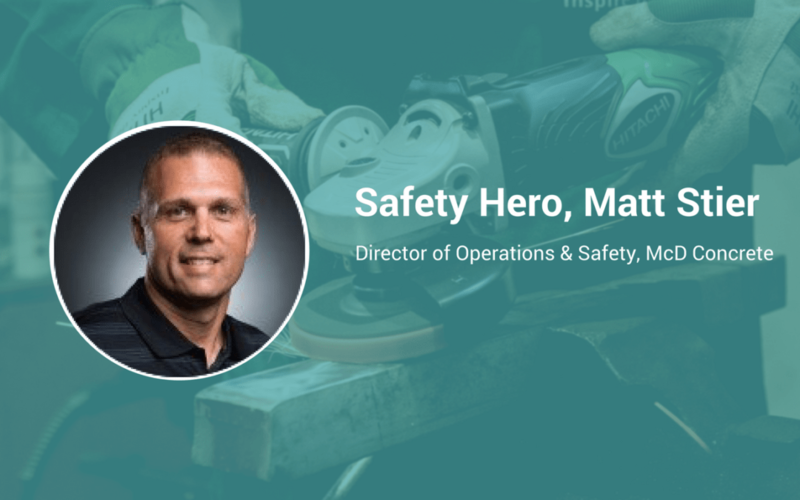 This week’s Safety Hero, Matt Stier, has made a career of serving others. Like many safety professionals, Matt began his career working in the military in the Medical Service Corp. Today, Matt serves as the Director of Operations & Safety at McD Concrete, where he is responsible for employee operations and safety. A family-man, football coach, and all-around great guy, Matt makes a great Safety Hero. Taking care of people has always been part of my job and the way I live. Serving in the Medical Service Corp, that was all I did. When I transitioned back to civilian life, I worked my way up in construction to assume both operations and safety. Safety started as one of those “additional duties” but now it’s where I spend a majority of my time. Having operations and safety go hand in hand is the key to our success. For me, it’s not a position – it’s part of my everyday working life. You have to ensure that the team understands that safety impacts every part of one’s life. Most importantly, you have to be able to communicate that to your people. To communicate effectively, I always ask the team “what do you do when you’re outside of work – what do you enjoy – why do you work?” If I get to know them, I can help them see how safety matters to their everyday life. Once you help people to understand that safety procedures are there to ensure that they can go home to enjoy those aspects of their life, it helps to keep things in perspective. I have. A few years ago, one of our younger workers nearly lost the vision in one of his eyes by simply snipping some wire. He was wearing the proper protective eyewear, but the wire still found a way to hit his eye. It showed me how quickly things can change, and that even when we take every single precaution possible, something could go wrong. It’s not a position – it needs to be part of your everyday working life. Safety is there to ensure a great quality of life. Everybody has something that they look forward to outside of work – spending time with your family, playing golf, or tennis, whatever it is – and safety is there to ensure that you can go do those things. My thought process and perspective – just thinking things through and being able to convey the importance behind it – the reason why. The engagement of management in safety and employee participation in safety programs. We need everyone involved and interested in order to achieve safety success. On average – there are three fatalities a day in the construction industry. Our collective goal as an industry should be to make that number zero.